Economics is one of the key causes of war - wherever there is a military conflict, someone is profiting from it. We call this "war profiteering". WRI looks at war profiteering in a broad sense - we consider all companies and initiatives that benefit financially from military conflict as war profiteers, in some sense. This includes the arms trade and companies profiteering for the privatisation and outsourcing of the military, but also those extracting natural resources in conflict zones, financial institutions investing in arms companies, and many others. 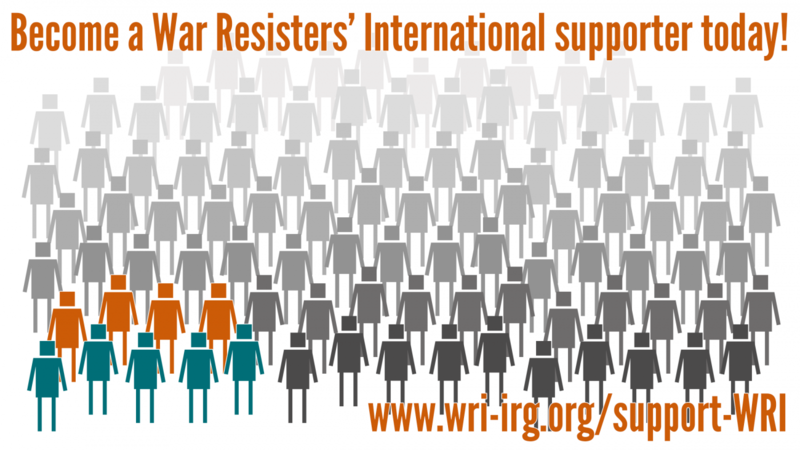 WRI publishes a quarterly magazine called War Profiteers' News (in English and Spanish), and organises events to bring campaigners and researchers together to share strategies against war profiteering. In 2017 we will gather members and friends of the WRI network in London, for a seminar called “Stopping the War Business”. Campaigners will share experiences and strategies of countering the arms trade and other war profiteers. The seminar will take place at the same time as the DSEI arms fair, where we will also take nonviolent direct action together. In 2015, we organised a similar event in Seoul, South Korea, which took place at the same time as the ADEX arms fair. In early November over a hundred activists from several European countries blockaded the entrances at the annual conference of the European Defence Agency in Brussels where arms manufacturers were meeting European policy makers behind closed doors. The conference was invite-only but the activists turned up without an invitation to let the arms dealers know that they were not welcome. In the draft EU 2017 Budget presented on June 30th, the European Commission proposed to start funding the military research industry with EU public money through a Preparatory action on Defence research (PA) of 90 million EURO for 3 years (2017-2019). This proposal crossed the traditional red line that EU budget should only finance civil activities and purposes. RE/MAX, one of the world’s largest real estate companies, is contributing to the Israel’s illegal settlement enterprise. Denver based RE/MAX International oversees more than 100,000 franchises in over 100 countries across the world, including Israel. RE/MAX Israel sells homes in all of the major settlements in the West Bank, including East Jerusalem and even has an office in the settlement of Ma’ale Adumim. From 14th-20th November 2016, Auckland Peace Action – a grassroots group based in Auckland, New Zealand – disrupted a weapons expo and military conference held in their city with a 'Week of Peace', with activists blockading the entrances to the exhibition centre and meeting a visiting US warship with a peace flotilla. In 2015, the same expo was held in Wellington, where it faced similar resistance. The event links the arms industry with government agencies, and it's principle sponsor is Lockheed Martin. On 16th and 17th November, over 500 arms dealers planned to meet for an annual gathering at the Viaduct Events Centre, and were met by a blockade of the entrances, with more than 100 people linking arms and disrupting several entrances to the building, despite violence from police and security. Aukland Peace Action estimated that only 130 delegates made it into the conference. The blockade included participants from a wide number of groups, including Pacific Panthers, No Pride in Prisons, Auckland Action Against Poverty, the Student Housing Action Group, Save Our Homes, Peace Action Wellington, the Quakers, Pax Christi, Racial Equity Aotearoa, Asians for Tino Rangatiratanga, the Health Sector Workers’ Network, Palestine Solidarity Network, West Papua Action Auckland, union members, climate activists, environmentalists, faith-based activists. Peace activists stop arms lobby: "No EU money for arms dealers"
War Resisters' International sections Vredesactie and Agir pour la Paix were joined by activists from across Europe earlier this month in a blockade of the annual European Defence Agency conference being held in Brussels. Arms dealers were meeting with policy makers to lobby for subsidies and to push the European Union further down the road towards militarisation. Using lock-ons, human chains, ribbons and banners to stop the arms dealers from getting inside, protesters succeeded in causing major disruption to the conference and bringing greater public attention to an issue of growing concern. Ferrovial is a Spanish multinational company, with a broad range of interests - they are involved in the construction of the Gugenheim Museum in Bilbao, the construction of the M3 motorway in Ireland, and manage toll roads across Europe. Ferrovial owns 90% of the company Broadspectrum, which runs Australia's offshore immigration detention centres in Papua New Guinea. A coalition of activists in the USA are preparing for protests against Urban Shield, a police training event and trade expo. Urban Shield brings together police departments from across the US and globally for intensive training " to learn how to better repress, criminalize, and militarize our communities." The event has been held annually in Alameda County since 2007, and recieves government funding. The Eurosatory arms fair took place in Paris this month. The 'Defence and Security' fair, one of the largest in the world, takes place every two years. For many years, opposition to Eurosatory took the form of one woman, Yvonna Kressman, faithfully standing outside on her own, over decades. Gradually the word has spread, and this year campaigners from Germany, England, Belgium and the Netherlands joined French antimilitarists and others to make sure it wasn't “business as usual” for the arms trade. There was significantly more disruption, protest and awareness-raising than ever before. This week the Eurosatory arms fair is taking place in Paris. The 'Defence and Security' fair, one of the largest in the world, takes place every two years. For many years, opposition to Eurosatory took the form of one woman, Yvonna Kressman, faithfully standing outside on her own, over decades. On 19th May, peace activists in Belgium took direct action at the arms company Advionics in Oostkamp, They climbed onto the roof of the company, put up banners and set up their tents. With their action they denounced the export of arms to Saudi Arabia, and demanded that the Flemish government fixes the loopholes in the Flemish arms export laws.